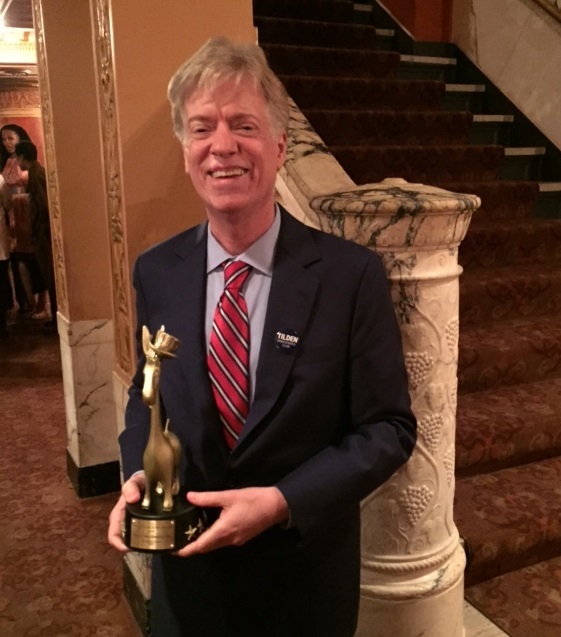 The New York County Democratic Committee hosted its third annual awards night – “The Demmys” – on Monday, July 13, 2015 at the American Airlines Theater on 42nd Street. Executive Vice President of Capalino+Company Mark Thompson, President of Samuel J. Tilden Democratic Club, accepted the “Club of the Year” award on behalf of the Tilden Club. This award highlights the Club’s success in implementing programs, activities, growth, and its impact on the community with Mark at its helm. The Demmys is an exciting evening of entertainment that recognizes stars of the Democratic Party for their outstanding public service. Awards were given to New Yorkers whose work has made an impact on the City and the nation. Hosted by County Committee leader and Assembly Member Keith L.T. Wright, the event featured a keynote address by Governor Andrew Cuomo. Many of Manhattan’s elected officials were in attendance, including former Governor David Paterson, former Mayor David Dinkins, Borough President Gale Brewer, Public Advocate Tish James, Council Member Rosie Mendez, State Comptroller Tom DiNapoli, Bronx Borough President Ruben Diaz, and Assembly Member Dan Quart. The Tilden Democratic Club’s mission is to help elect the most qualified candidates to public office. The Club also acts as a liaison between government officials and the club’s constituents by creating forums where these two groups can meet to discuss issues. The club’s membership doubled this year, and focus committees were established to tackle specific issues concerning the community, such as healthcare and housing. An avid member for over a decade, Mark is serving his second term as President. Mark characterizes the club as “fun and active” and unlike conventional political groups. Capalino+Company is a long-time supporter of the Samuel J. Tilden Democratic Club, and we congratulate both Mark’s and the Club’s efforts in strengthening the Democratic community of New York. Sign up for our weekly newsletter here to keep up with the latest news in New York.